So today's Shoe of the day isn't actually a shoe, it's a shoe accessory - one that will make your flip flops and sandals much more fashionable. So this being the start of the cold weather vacation season (trip to the islands anyone? ), what better time to give you style options to spice up your vacation footwear. Strandals is a stylish new accessory that turns any boring flip flop into a chic sandal. 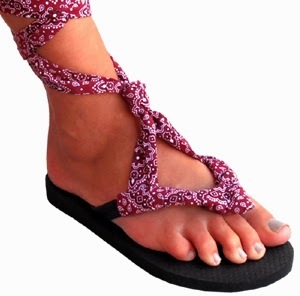 The fun colored wraps tie around the straps of flip flops to give cool new stylish looks! 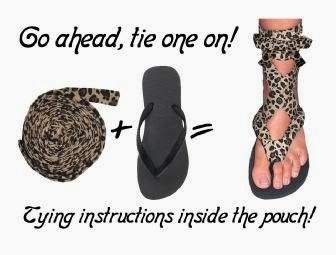 It is a great way to change up the style of your shoes with endless possibilities plus you get to keep the comfort of your favorite flip flops but with more fashion options. Strandals also makes packing for travel ideal by minimizing the amount of shoes you pack because of the multiple looks you can achieve with a single pair. Strandals are 50% poly and 50% cotton, come in a variety of fun prints and colors, and can be tied variety of ways for great fresh looks and retails for $9.99 a pair. Get to know more at www.strandals.com.